INTIALLY C.G.G.&D. BEGAN AS A COMMERCIAL INTERIOR LANDSCAPING COMPANY. OVER TIME AS WE BEGAN OFFERING OUR SERVICES FOR THE HOME, DURING OUR CONSULTATIONS WE REALIZED THAT MANY OF OUR CLIENTS HAD BEAUTIFUL ITEMS THEY ARE NO LONGER INTERTESTED IN, WHILE MANY OTHER WERE READY FOR SOMETHING DIFFERENT. EVENTUALLY WE BEGAN TO NETWORK THESE ITEMS BETWEEN OUR CLIENTS BY WORD OF MOUTH. AS THE INVENTORY GREW , SO DID THE NEED TO CREATE OUR UNIQUE DECOR CATOLOG. WE'VE ONLY JUST BEGUN TO OFFER THIS CATOLOG ONLINE SO IT DOES NOT REFLECT OUR ENTIRE DECOR INVENTORY WHICH IS MUCH LARGER THAN WE ARE ABLE TO SHOW ONLINE AT THIS TIME. IN THE MEAN TIME IF YOUR ARE INTERESTED IN SEEING THE ENTIRE CATALOG JUST CLICK BELOW THE MAILBOX AND WE'LL FORWARD YOU MORE INFORMATION & PHOTOS. WE APPOLOGIZE FOR ANY INCONVENIENCE! 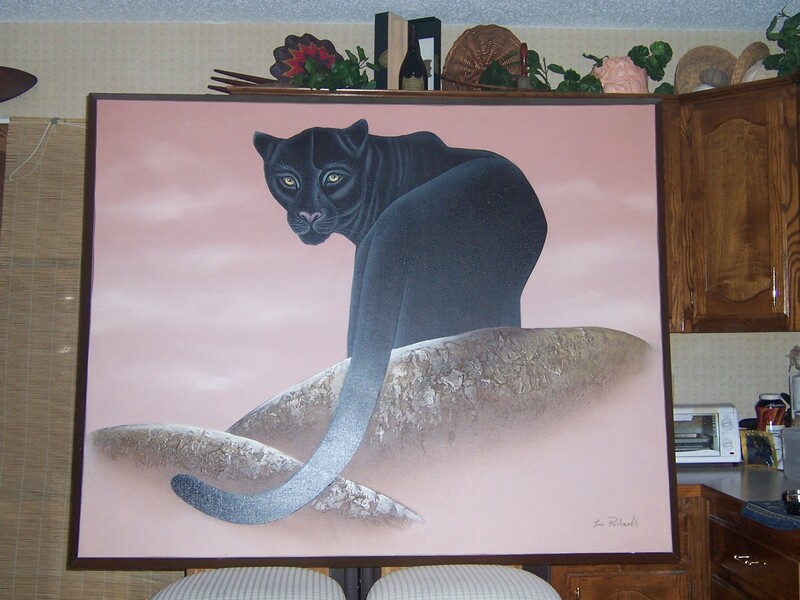 THIS PHOTO DOES NOT DO JUSTICE FOR THIS TRULY GORGEOUS, 3.5' x 5', HAND PAINTED BLACK PANTER. YOU SHOULD SEE IT IN PERSON!! THE CLEAN LINES OF THE INVERTED WOOD FRAME GIVE IT AN EXTRA TOUCH OF CLASS!